Presents are wrapped, baking is done, lights are up, and cards are sent. What have I forgotten? Well, how about a little fun? A little festive holiday cheer? How about enjoying a little time with family and friends? I think that is a must, especially during the holidays. Last year, Todd and I started a holiday party tradition in at house. We certainly aren't the first to come up with the idea of having a house full of close friends dressed in really ugly holiday sweaters and I am sure we won't be the last. Yes, that's right, we have taken on the latest ugly sweater holiday trend and let me tell you... it is a blast! Let's be honest, looking ridiculously silly in a Christmas sweater that some person seriously cherished at some point is just plain funny. It really sets the mood for a fun party. This year there were LOTS of ugly vests, sweaters, and holiday cheer! Some of them lit up like a Christmas tree, some were decorated with ornaments from a Christmas tree, and some were just REALLY ugly. It was hard to determine a winner because each ugly sweater had it's own dimension of ugly... between the swan that centered Todd's festive grandpa sweater, the gold and red beads that lined my pointsetta circus, Mickey and Minne mouse (enough said), and a Christmas bear sweatshirt that read, "I've been beary, beary, good this year!" - it was really just a toss up and a winner couldn't be determined. All in all though, we had a fantastic party and really good food and company. What better way to spend to the holidays? Preheat oven to 350 degrees. Butter an 8-inch square baking pan or heatproof glass dish. Line pan with parchment paper, leaving a 1-inch overhang on 2 sides. Set aside. Place butter and chocolate in a large heatproof bowl set over (but not touching) simmering water; stir frequently until chocolate and butter are melted, about 7 minutes. Remove bowl from heat; let cool to room temperature, 10 to 15 minutes. Stir sugar into cooled chocolate mixture until combined. Whisk in eggs one at a time, whisking until smooth after each addition. Whisk in vanilla. Gently fold in flour and salt. Pour batter into prepared pan, and smooth top with an offset spatula. Bake until cake tester inserted in the center comes out with only a few moist crumbs attached, 40 to 45 minutes. Transfer pan to a wire rack to cool completely. Run a knife or offset spatula around the edges of the pan. Using parchment, lift brownies out of pan and onto the rack. Transfer to a cutting board; cut into small round circles using a cookie cutter. Using a stand mixer with a paddle attachment, beat butter and mascarpone cheese until light and creamy, about 2 minutes. Add vanilla extract and salt. Add 2-1/2 cups of sugar, half a cup at a time and continue beating until smooth. Add more sugar, if needed to reach desired consistency and sweetness. Put into piping bag. Pipe a ring of vanilla buttercream on top of each brownie. 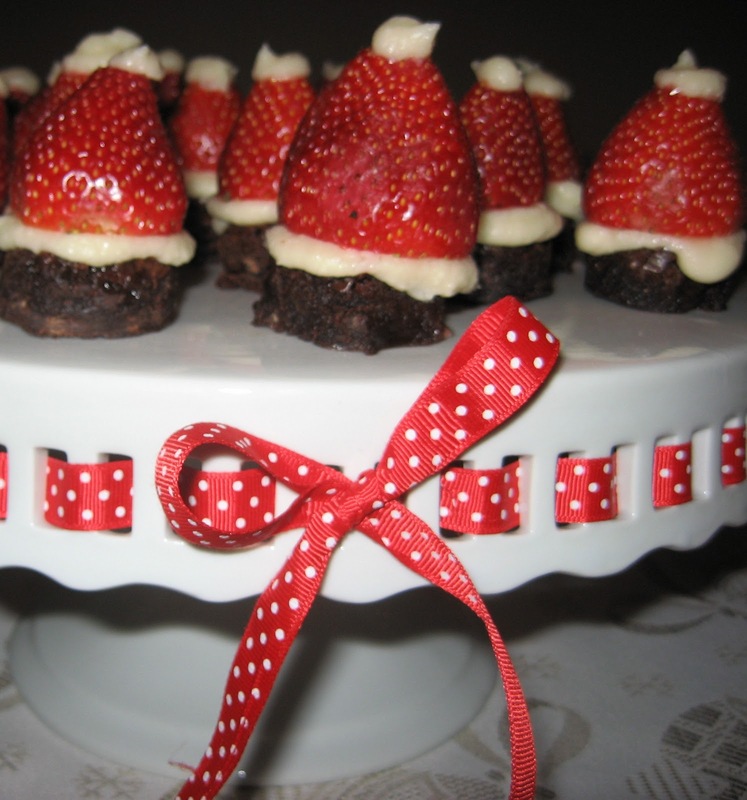 Cut off the base of a strawberry so it is flat and place it upside down on each brownie, pushing slightly to secure in place. Top the tip of the strawberry with a dot of buttercream to finish the santa hat. Note: If making them ahead of time, please make sure to set them in the fridge. I left them out for less than 20 minutes and the frosting started to get too soft. (Hence the pretty bad picture above.) I threw them back in the fridge and voila... back to great! Krystle and Todd -debating whether or not a keg stand is good idea at our age. There are only five days until Christmas Eve. Enjoy them... and have a VERY Merry Christmas!! lindsey, andy and i made the same brownies! i didn't even see yours! :) different recipe, but same concept. i'll have to use martha's brownies next time ... they look fantastic!